We were wondering how producer Ed Boon and the team at NetherRealm Studios would be making announcements for Injustice 2 at San Diego Comic-Con this week, since the game doesn’t really have any sort of official panel lined up. Well, now we know – it’s all about that DC All Access! The company announced on the official Injustice 2 Twitter account today that Boon and company will be taking part in a special livestream that’ll kick off Friday, July 21st, at 1:00 PM PDT. 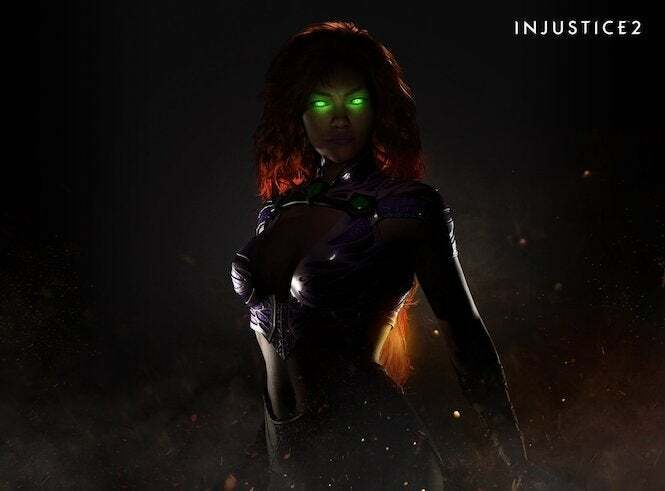 It also showed a picture of Starfire hiding in the darkness, with her eyes all aglow green, indicating that we’ll be seeing the first official gameplay with her during the stream. “Live from #SDCC2017 – a special livestream event tomorrow with @noobde on #DCAllAccess at 1 PM PDT!” the company tweeted. You should be able to watch all the action happen here. It’ll be a good opportunity to see Starfire in action, and that should also wrap up the current three-pack of downloadable content for the game, which also featured Red Hood (who debuted in June) and Mortal Kombat veteran Sub-Zero (who arrived earlier this month). This could indicate that Starfire will make her way to the game sometime in August, though we’ll likely know a more official release date after the livestream tomorrow. But we can’t help but ask – is that all we’ll be seeing from tomorrow’s livestream? Because it is San Diego Comic-Con after all, and there’s a good chance that Boon and company might have some more surprises for us – such as a potential peek at the second DLC pack that will be coming to the game, and the next round of characters that could be making their way into the arena. It’d be a good chance to see who’s lined up, and, more importantly, how they compare to the other combatants already in the game. We’ll keep you informed of what all is revealed tomorrow afternoon after the livestream takes place, so be sure to check back for the full recap, as well as hints as to how to master Starfire’s type of gameplay. We can’t wait to see her in action. Injustice 2 is available now for Xbox One, PlayStation 4 and PC.